Riley and his story references a massive digital archive that has remained primarily invisible and unstable. What do other U.S. citizens’ archives look like? (Including those of us who have not been in combat but experienced it through family, through absence, consumed it through media, or in other ways). 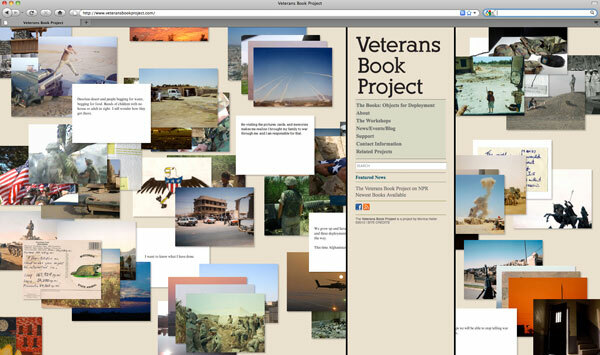 Monica is working with these current war veterans and their images from combat to create a library of books. To make their individual books, participants insert their images and texts into a template and software that has been designed specifically for this. The text is generated from their conversations together, veterans’ e-mails and journal entries from combat. Each participant will have his or her own book to take home, share with family or friends or to keep for their own archives. His or her book will also become part of a larger edition. In this unit each story is individually important and independent from its counterparts, but part of a greater whole. What will be the testimonial significance when we gather many people's voices and pictures together? What will that collective story look like? For more information, please visit the Veterans Book Project web site.